Could be a very useful tool indeed! V/Oct, V/HZ too. This looks so incredibly useful. And if they have actually incorporated the learnings from the early stumbles of the beatstep...this could be a real monster. Color me interested. I'm skeptical of Arturia's products along these lines by now and I'm pretty done being an early adopter. The BSP had some serious teething issues including flat out regressing in functionality while they were trying to fix it. I do hope it sees light of day with well-thought-out functionality and is bug-free, or in the event that it is plagued with bugs they at least get fixed in a timely manner and the thing is not brushed aside when it's time to wow everybody at the next trade show with something else. I could see myself getting one for my portable situation if it works out though. I'm curious how the sequencer works, and if it has a clock input. Has MIDI in + "SYNC IN and OUT (supporting 1 pulse per step, 2 PPQ, 24 PPQ DIN Sync, and 48 PPQ DIN Sync)"
The keys are weird for not starting on C but that doesn't matter. I think this will be it. Maybe they will do a bigger version by the time of release. I'm surprised more people weren't making these. Seems like eurorack keys are a pretty hot ticket. Looking forward to the Keystep Pro for NAMM '17! This one is interesting. I may get when 3 or 4 oct version is released. This could be really useful. Thanks so much for including proper DIN connectors (not just USB only) as well as the sustain input! If this turns out to be what they say it will be PERFECT for what I want in a controller. Built in arp and cv out with midi will mean it will connect to everything I've got. I would kind of prefer a bigger version but honestly it's worth it for the arp and cv alone. Check out the Akai Max 25 or 49. It has the arp, CV outs, MIDI, and sequencer. Where it lacks is the additional sync inputs and CV out for the mod wheel, but it has full size keys. Very useful (once you get passed the "whore thong red" plastic of the outer shell). "once you get passed the "whore thong red" plastic of the outer shell"
That is a potential problem that can be overcome with the plethora of modular manufacturer stickers that seem to breed at scary rates. However, if the Keystep is (relatively) bug free, the price and functionality look pretty good. The size is also a useful size from a space point of view. I was about the Beatstep Pro, too, however. Looks like this is available for presale @ $120 from sweetwater?! looks like it ships April 22 from musicians friend! I'm looking for a decent keyboard for my A4's multi-map, and with a few more octaves than the onboard key buttons. A 32 key "slim key" velocity and aftertouch sensitive keyboard with DIN MIDI output for $119 ain't a bad deal. The sequencer is a bonus, though I would take the sequencer more seriously if it had more pattern memory. I do hope that this isn't plagued with the growing pains of updates that it's older __-step siblings have had to deal with. It's like an SH-101 without the synth engine. I would like more keys though, but seems great for the price. When I had a Microbrute, I didn't really care for the synth engine and 25 keys but found the connectivity really useful. This almost seems to fix that. An envelope and LFO would have been handy but hardly a realistic expectation. Let's hope it actually works! Me too on all this. I want to superglue this thing to the front of my Karp Odyssey. I would gladly give up 5 keys in exchange for better MIDI and a 64 note sequencer/arp. I have been excited for this for a while. I hope it hurries up and gets released! why does it start on F? It's 32 keys so it ends on C, just like a 37 key keybed would. 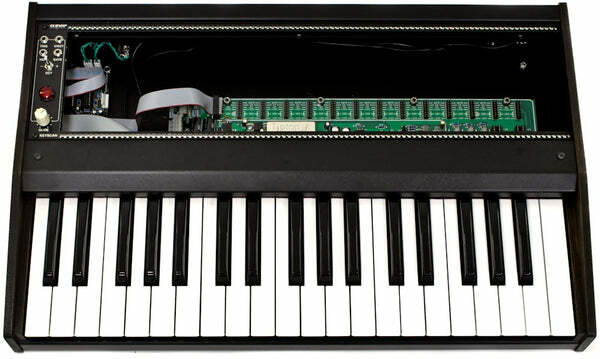 The SH-101 has 32 keys, and starts on F, too. So, I wouldn't be surprised if the Keystep was, in part, influenced (or inspired) by the 101, with regards to the layout of the keys.